Highly digestible formula supports optimal nutrient absorption, real duck as a high-quality source of protein. Contains linoleic acid, an omega 6 fatty acid, to help promote healthy skin and coat. Duck, Liver, Meat By-Products, Water Sufficient for Processing, Ocean Whitefish, Inulin, Essential Nutrients and Other Ingredients: Minerals (Potassium Chloride, Tricalcium Phosphate, Salt, Zinc Sulfate, Ferrous Sulfate, Manganese Sulfate, Copper Sulfate, Potassium Iodide), Vitamins (Choline, Vitamin E, Vitamin B-1, Vitamin B-3, Vitamin B-5, Vitamin A, Vitamin K, Vitamin B-6, Vitamin B-2, Vitamin B-12, Vitamin B-7, Folic Acid, Vitamin D-3), Guar Gum, Taurine. A466217. 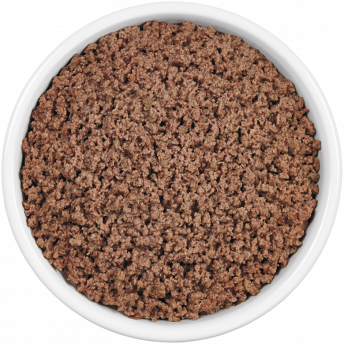 Animal feeding tests using AAFCO procedures substantiate that Pro Plan Focus Sensitive Skin & Stomach Duck Entree Grain Free Classic provides complete and balanced nutrition for maintenance of adult cats. FEEDING: Feed 1 can per 3 to 3-1/2 lbs body weight. Adjust as needed. Divide into two or more meals. Refrigerate unused portion.